For those who do not know, I am a true Gemini. I have a good twin and an evil twin, both of whom sit on either shoulder. They usually argue over working out vs. shopping, healthy vs. comfort food and how much wine one can consume on a given evening. Due to my "split personality" I have learned to take foods which I used to rely on for comfort and turn them into healthier options. Insert Silk Pure Almond Unsweetened Almond Milk - 30 calories. I was very excited when I was invited to try out Silk Pure Almond Unsweetened Almond Milk. My Mom is lactose intolerant and has used Silk for ages as a replacement to dairy. With my familiarity to the product, I knew the recipe options were endless. Lightened up Southern mac and cheese, skinny chicken pot pie, at home soy latte's...I can go on and on. Upon viewing all the recipes on Silks 30 New Recipes by 30 food bloggers using Silk under 30 calories, I couldn't wait to get started. Make sure you check their facebook app (by clinking here) out where you can view all 30 recipes, many of which are by bloggers I admire! For my recipe, I decided to take one of the recipes located on Soy's website and make a few minor tweaks. I come from a household of two people and we do not need 30 cookies, so I cut the recipe in half. Most of the cookies are being sent to work with the Mr. tomorrow. I also used Reese's pieces along with the chocolate chips. 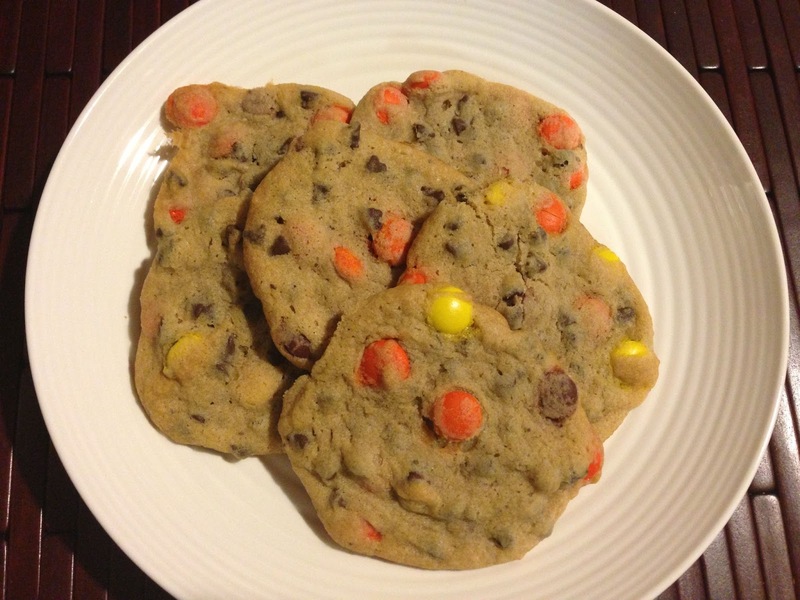 The recipe below is for 15 cookies using candy. Use your own imagination - you can use toffee chips, nuts, white chocolate chips, etc. The options are endless. By the way, this recipe is BOY APPROVED and since there are no raw eggs involved, you can eat the cookie dough, whoop! As I only bake on special occasions, Gabe became skeptical seeing me make homemade cookies on a random Monday night. He knew it had to be blog related and asked if this recipe was "skinnied up". I told him no, he took a bite, then exclaimed they were amazing....I admitted my skinny fib. He then took three more cookies off the plate and rolled his eyes, knowing that he wouldn't have touched the cookies if the truth was told before the first bite. 2. Using an electric mixer or sturdy wooden spoon, cream margarine (or butter) and sugars until light and fluffy. 4. Combine the dry ingredients in a mixing bowl. 5. Add dry ingredients to the creamed mixture and stir to blend. Fold in the chocolate chips & candy. 6. Drop by teaspoon onto buttered or parchment-lined cookie sheets. These look & sound so good!! I haven't used Silk Almond milk before. I am going to give it a try! Sounds delicious. I love Silk almond milk and use it to make lighter versions of my curry dishes. Now I want these cookies!